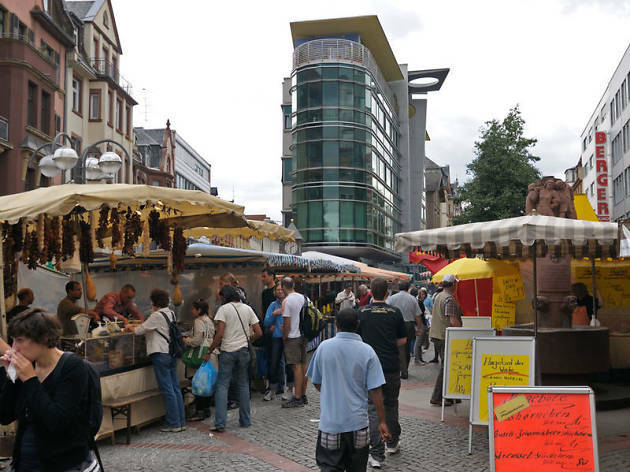 Find the best of Frankfurt cafe culture on the picturesque upper Berger Strasse. 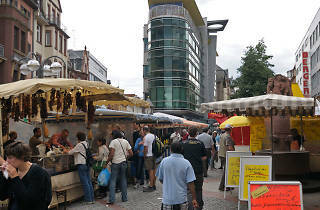 On Wednesdays and Saturdays a weekly farmers’ market is held near the Bornheim Mitte metro station, between the old clock tower (Uhrtürmchen) and Saalburgstrasse. You’ll pass that and head north, away from the city center, to where dozens of restaurants and bars offer outside seating at the first suggestion of spring in the air. The half-timber buildings are all original, and date from the 1600s. When the sun sets, the street glows with candles and lanterns. While Berger Strasse is an excellent destination for a reliable German meal, you could also try spaghettieis—vanilla ice cream squeezed into spaghetti-like noodles, served with strawberry sauce—from one of the many ice cream parlors.